My husband’s birthday coincides with the start of the asparagus season. 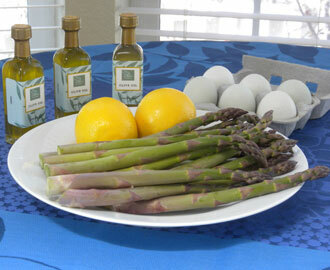 When we first moved to California, his birthday dinner always included fresh asparagus. Years later, we still can’t wait to cook those first stalks, a true harbinger of spring. Lemon olive oil, made by either crushing the citrus along with the olives or by infusing the oil, is a natural companion for asparagus. Many California producers use Meyer lemons, a special crop in the state, which are more floral and slightly sweeter that the standard Eurekas. Although I love lemon oil, it might be too much by itself, so I mix it with a delicate extra-virgin olive oil in these recipes. The roasted asparagus will stand on its own, but if you want to elevate it to another level, serve it with the mayonnaise. Put the egg yolks, lemon juice, salt, and a few grindings of pepper in the small bowl of a food processor. Mix the oils together. With the processor running, drizzle the oil through the feed tube, starting with a few drops at a time and gradually increasing to a thin stream. Add all the oil, then the water. If the mayonnaise is too thick for your taste, add a little more water. Transfer to a serving bowl, and refrigerate if not serving immediately. Serve warm or at room temperature. Pass the lemon olive oil mayonnaise on the side. This recipe also works well with our other The Olive Oil Source Citrus Natural Flavor Infused Olive Oils.